It might seem churlish to shoot down a film about a prominent civil rights icon, particularly in a week which saw Barack Obama sworn in to the highest political position in the world, but there is something deeply unsatisfying about Gus Van Sant’s biopic of Harvey Milk, which suffers from a severe case of ‘biopic-itis’: time and time again I felt like this was a made-for-TV movie, albeit a well-made one, but nevertheless entirely lacking in anything which demanded its presence in the cinema. Or is Milk indicative of US cinema audiences’ inability to handle homosexuality portrayed onscreen with any sort of invention – the more interesting Queer Cinema of Van Sant’s own Mala Noche (1985), for instance? The story of Harvey Milk is a fascinating, multi-layered one, and one which is surprisingly little known outside of San Francisco. At its centre, we have the reluctant hero, a gay man who realises at the age of forty that he has nothing to be proud of so far in his life, and who goes on to become the first openly gay elected public official in the US. Then there is the downfall, and the villain: Dan White, a colleague of Milk’s who notoriously shot both Milk and San Francisco Mayor George Moscone, and then even more notoriously received a reduced sentence of manslaughter on the basis of his having eaten too many sugar-coated cakes that day. 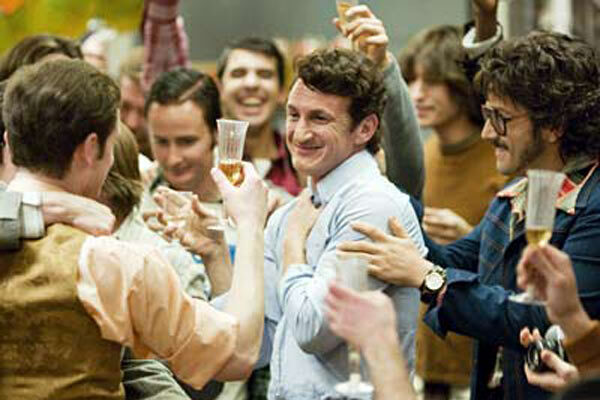 For those who do not know the Milk’s story, the film does come as an important lesson in one key moment in the history of the gay rights movement. Fine. The trouble with this is, that it is quite simply all the film does: tell us the story. What are interesting characters – Milk and his followers, the probably closetted White, the rather scary poster girl of the religious right Anita Bryant – are all sketched out for us, but because the film’s rigid adherence to the traditional biopic rules of merely illustrating key events in the protagonist’s life, we gain little or no insight into what made these men really tick. White in particular, Josh Brolin at his most nuanced and subtle, would have made a much more interesting character study than what his scant over-expository screentime here allows. Much of what we see feels a retread of Rob Epstein’s superb The Times of Harvey Milk (1984) documentary, whose existence only further calls into question the neccesity for further biography. Is it fair to criticise a film which brings into wider public knowledge the struggle against prejudice and bigotry which still continues to this day? In aiming for the mainstream, Van Sant is perhaps aiming to educate rather than to make any bold artistic visions, but his doing so seems to me an admission of defeat: that despite the success of the likes of Brokeback Mountain (2005), the subject is still one which must be diluted rather than explored with any level of complexity.